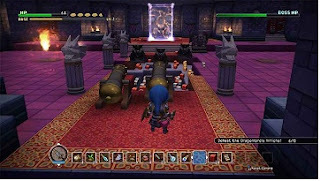 In Dragon Quest Builders, there are four Thalamus puzzles that can offer you some special rewards and help you overcome challenges. You will encounter these puzzles in the 2nd chapter of the game. Once you have completed the first three puzzles, you will be presented with a small puzzle, which is quite easy. In our guide to Dragon Quest Builders we will show you how to solve these puzzles. Each time you complete one of the Talamus’ puzzles, you will receive a gift to help you fight against the Hades Condor. This is the final boss of the second chapter and requires a little more skills than the Golem of the first chapter. By the way, the puzzles are necessary to complete the challenges in Dragon Quest Builders. It is very important to note that you should not waste the special block you receive after completing a puzzle! Keep them with you, they are important! Build a room for the first Thalamus’ puzzle. You will need the items listed above and you will receive a white block as a reward. In addition, there will be an iron ax for your inventory, which will help you get rid of the giant creature. If you completed the first puzzle, you should go through the blue portal and go west. There you just need to walk straight ahead and you will encounter the second thalamus’ puzzle. But before you pack palm seedling and planted them in the space on the intended area. Here, you’ll get a blue block. For this puzzle you don’t need to take extra items with you. You will find everything you need at the location of the third Thalamus riddle. Pass the red portal and go north-east. Be careful, as you will encounter many skeletons on your way, which also have two lives. Go into an area where you find many bricks. Walk past the ancient temple and you will find the location of the third thalamus riddle behind the mountain. The solution to the puzzle is that you get the clock at 3 o'clock. Previously it points to 9, and once you have reset the clock, you should find a nasty fire in the left chest as a reward. In the right chest you will find a red block. Hope you still have all the blocks with you. Now, go through the green portal and then go south. You must cross the earth and limestone mountain to find a thalamus’ building on a green meadow. A very dangerous golden golem awaits you. You come to a place in the puzzle, where you simply have to use the colorful blocks on the right columns. As a reward for your trouble, you will learn how to make the Catholicon ring. This ring protects you against all negative status effects. Not only can this protect you against many monsters, but it is an enormous help in the fight against the final boss of the chapter.